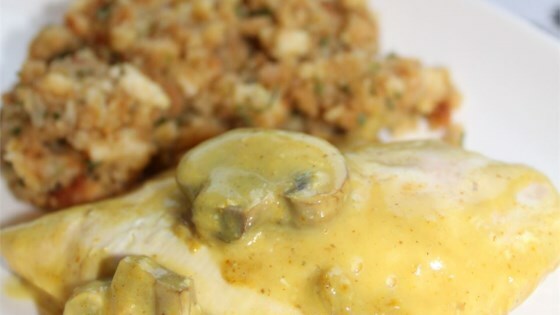 "Skinless boneless chicken baked with a prepared stuffing mix and topped with a creamy sauce." Line bottom of a 9x13 inch baking dish with chicken breasts. Spoon prepared stuffing mix over chicken. Mix the cream of chicken soup, cream of celery soup, sour cream, curry powder, and lemon juice. Pour mixture over top of stuffing. Bake uncovered in the preheated oven for approximately 1 hour, until chicken juices run clear. Wonderful!!! My family loved this meal.We had Stove Top stuffing mix and used that. Our family will keep this recipe and we thank you for it. The cream sauce was a bit thick. Next time I will add some water. Good taste I liked the curry flavor. I would make this one again.